Watch to See Why These Fast Food Employees are Freaking Out! 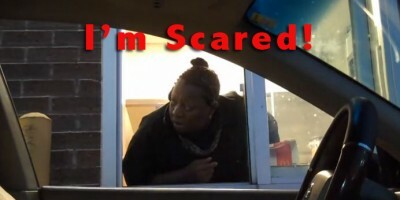 Watch these fast food employees freak out when a car pulls up to their drive-thru window and no one is driving the car. What would you do if a car pulled up to your drive-thru but there was no driver in the car? Or is there? This YouTuber is a great prankster and has an entire video series of doing drive-thru pranks just like this one. If you like this video, you’ll have to go find the other ones he has created too. They are definitely worth watching. Or better yet, what if you could be the one pulling this prank and be able to drive up to a fast food drive-up window and be invisible? It is such a clever little prank and I wish I could do this in my own town…LOL — That would be pretty hilarious! Watch the reactions of these poor unsuspecting people when there is no one to give the food order to… watch the video below and see what they do next… These fast food employees freak out – and it’s so funny!